After missing out on the 2015 World Cup and losing ODI status to boot, Kenyan cricket is in a desolate state. Their appearance in the 2003 World Cup semi-final embodies a better age, 11 years ago and a world away. One member of that side is not feted today. Maurice Odumbe was Kenya's outstanding player in that tournament, averaging 42 with the bat and taking nine wickets. No one remembers that now. In August 2004, he was banned from cricket for five years for associating with a "known bookmaker". Perhaps surprisingly, Odumbe is not reluctant to talk. He is courteous, charming and generous with his time. And he continues to deny any wrongdoing. All he accepts was that he had a friendship with the alleged bookie, the Indian businessman Jagdish Sodha. "He was always saying that he was in the movie industry, and I could see one or two posters with his name on it," Odumbe says. "I don't think his business card was printed 'bookmaker'." The explanation is less convincing, given that Odumbe admits to having known him for eight years. "We were not bosom buddies, it was just once in a while 'Hi, how are you?' You know, that sort of thing. "I never stole anybody's money, yet I was given five years," Odumbe says. "I was banned for inappropriate contact, it was never match-fixing, but they don't seem to want to get it right. I think 'match-fixing' sounds much sweeter. "The only way probably I would have known is if he had approached me, and said, 'Look, can you do A for me?' In fact, there was a time even when the investigators came talking to me, they asked me the same question: 'How could you not know that he was a bookmaker?' I said, 'Ah, well, it's not written on his forehead.'" Odumbe finds enemies everywhere in the case against him. He feels wronged by the ICC, who appointed the Zimbabwean judge Ahmed Ibrahim to chair the case against him. "When you look at other cases, it was always a local judge who would preside over the matter, and then send their findings to ICC," Odumbe says. "But in my case, the ICC investigated me, they were the ones who passed a sentence on me." He also feels wronged by the Kenyan board. "If you look around, all over the world, the local boards have always stood by their players. But in my case, my local board, they left my head on the chopping board. Sometimes people even wonder, is it a question of colour, or what is it?" And than there are his exes, including former wife Katherine Maloney, who testified against Odumbe. "If you look at the witnesses that they brought in my case, 99% of them were former girlfriends, so obviously they had a bone to pick with me." After taking 3 for 15 against West Indies in the 1996 World Cup match Kenya won, Odumbe went up to Lara in the changing room and handed him his autograph. "I asked for your autograph and you wouldn't give it. Now I am saying you can have mine"
Such a list of grievances sounds like the paranoia of a man refusing to admit guilt. But when Odumbe asserts that his punishment was harsh compared to those received by some more prominent names, he perhaps has a point. "If you look at Shane Warne and Mark Waugh, they accepted giving information to a bookmaker, and what happened to them? It was just a slap on the wrist." 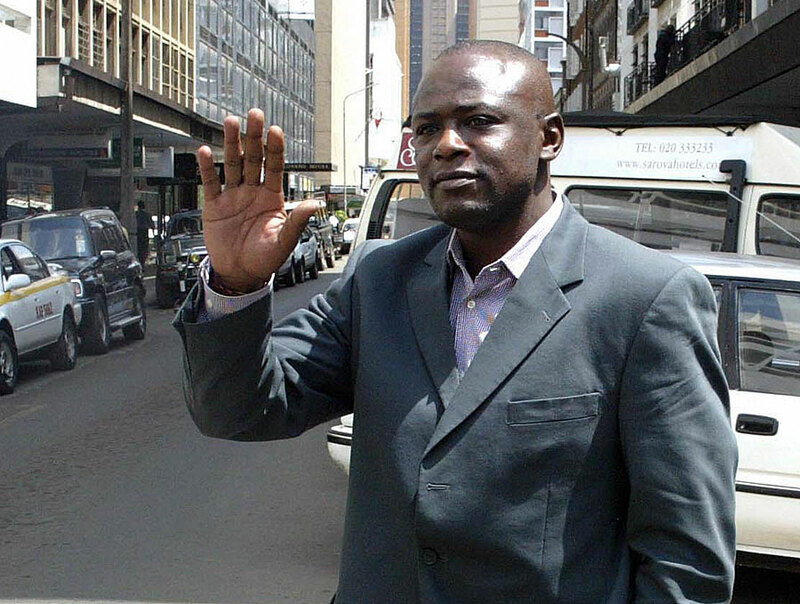 While Tom Tikolo, who was accused of embezzling $10,000 in 2009, has been allowed to return to the fold, Odumbe remains ostracised from the running of the game in Kenya. "Where is the integrity here? I never stole anybody's money, yet I was given five years. I am persona non grata, right?" He asserts that the officials in Cricket Kenya "feel threatened by somebody like me, with my presence, asking if someone like me is not being used, then who are they using?" He shows no sign of remorse. "The only wrong I did is befriending the gentleman. When it comes to the integrity of the sport, I think I gave it my best, I gave it my all, and the good thing is, I sleep easy knowing that whatever happened to me, I was wrongly accused, I was wrongly sentenced, without any mercy, without any chance of an appeal." No other Kenyan was ever found guilty of corruption, but Odumbe does not believe that this is proof of a clean game. "I've heard rumours and I know for a fact that the investigators were down here to talk to a few players." Odumbe's fall was particularly harrowing because of his family's stellar contribution to Kenyan cricket. After Kenya was awarded independence in 1963, the sport, till then the preserve of the white and Asian populations, slowly began to be Africanised. In 1976, Kenneth Odhiambo Odumbe became the first black African to play for Kenya. Four of his brothers would later represent the national team too. For black Africans, cricket was not just a sport but an escape route. The Odumbe family was raised on an estate for government employees in Nairobi, and lived next to the Sir Ali Muslim Club. Out of curiosity, they started to watch matches there and to play themselves. The Odumbes used a plank of wood as a bat, and maize coir as a ball. "We took a dustbin, the dustbin would be the wicket and then we just played cricket in between the streets of the estates." When they practised on the boundary edge during games at the club, their talent was noticed. The Odumbe brothers got the chance to train and play for the club. The Sir Ali Muslim Club paid for Maurice's school fees from the age of 14. "At school I used to play rugby and football, I used to run for my school, but it seems like I was drawn more into cricket, probably because of the money I started earning early." The story of the Tikolo family, who contributed two captains to Kenya - Steve and Tom - is strikingly similar. They also grew up near the Sir Ali Muslim Club, where they watched matches with the Odumbes. The only significant difference was that a benefactor from the Swamibapa Sports Club spotted the Tikolos, and signed them to play there. Together these two families inspired Kenya's rise. They provided three brothers each to the side that was the runner-up in the 1994 ICC Trophy, qualifying for Kenya's first World Cup in 1996. Even in their heyday, Kenya's playing strength was always over-dependent on a select few families. For all except Steve Tikolo, who played for South African first-class side Border in the winter of 1995-96, training before the World Cup was limited to weekends and in the evening after a full day's work. When Kenya requested white balls to train with before the tournament, the board could only afford to give them red balls painted white. During the World Cup, the players were paid only a US$10 allowance. All of this made the triumph over West Indies, who collapsed to 93 all out, so memorable. It was especially so for the captain, Odumbe. Two years earlier, he had asked Brian Lara for his autograph after a Warwickshire game in Swansea, where Odumbe was playing for a club. Lara had declined. After taking 3 for 15 against West Indies in the said match, and winning the Man-of-the-Match award, Odumbe now went up to Lara in the changing room after the game and handed him his autograph. "I asked for your autograph and you wouldn't give it. Now I am saying you can have mine." Plenty of other international stars would soon become familiar with Odumbe and the Kenyan team. They became a semi-regular presence in triangular and quadrangular series, and were widely expected to become the 11th Test nation. "The country was right behind us - that was the talk of the town." Yet the success of 2003 proved not to be a springboard but a curtain call on Kenya's great era. Damningly, there are more nets in some public schools in England than in every state school in Kenya combined. As Aasif Karim did recently, Odumbe calls Kenyan cricket "dead and buried". "We missed out, we missed the boat," Odumbe reflects. "Cricket remained a closed shop, just for a few elitists. If you don't belong to a club, forget about playing cricket." The depth of talent became so shallow that when Odumbe returned to the Nairobi club scene after his five-year ban in 2009, at the age of 40, he was still one of the best players around. Without his chequered past, he might have earned a recall. "People who understand what cricket is are ashamed that cricket has reached this level," he says. But Odumbe's own actions, interpreted as evidence that greed was not the preserve of Kenyan cricket administrators alone, made it easier for the cricketing world to forget about Kenya.